Ken says: "Your coaching, instruction, and words of wisdom went a long way in helping Jason and I hook, fight, and land our fish. I thought Jason responded well to your instruction. My sense is you have a way with instructing anglers both young and old. "Your operation is first class all around and it was a pleasure spending the day with you. You did not let down a minute and were intent upon hooking us up with fish all day long. Some guides would let the baits sit or take a break...you work for action and it is obvious...a true testament to your enjoyment of angling and your dedication to clients. We admire your stamina and can't tell you how desirable that quality is in a guide. You have undoubtedly hooked us on tarpon fishing." "It was only through your coaching, amazing boat handling, and vast tarpon fishing experience that landing one of those silver torpedoes was made possible. Your efforts made our trip exciting and memorable. To be honest, even if we didn't boat that tarpon, we were already planning a return trip...the experience was fantastic." Actual Letter: You did not let down a minute and were intent upon hooking us up with fish all day long. Some guides would let the baits sit or take a break...you work for action and it is obvious...a true testament to your enjoyment of angling and your dedication to clients. We admire your stamina and can't tell you how desirable that quality is in a guide. You have undoubtedly hooked us on tarpon fishing. I admit, I've been admiring the picture of that tarpon since we left you that evening. Friends, family, and work colleagues are all amazed. However, it was only through your coaching, amazing boat handling, and vast tarpon fishing experience that landing one of those silver torpedoes was made possible. Your efforts made our trip exciting and memorable. To be honest, even if we didn't boat that tarpon, we were already planning a return trip...the experience was fantastic. As I make frequent trips to visit family in Ft. Lauderdale and Ross is easily able to fly into town, we undoubtedly be in touch in the near future to book more trips with you. I met Mike while I was eating at my favorite lunch spot CHILLY WILLY'S for the best "Beacon Cheddar burger" in Islamorada. He overheard me consoling the owner's son about "appreciating every fish you hook large and small" and "do not compare it to your brother's fish." Do not torment yourself, small fish can fight harder too. Enjoying the time fishing is most important because it's family memories for life. Cheer each other on, and enjoy each fish you hook like it's your last. "It was nice to see how you handled your young friend (12 year old son of my local client), from a previous fishing trip. I feel that you may have instilled something in that young angler, that well may have been eating him up inside (the competitive nature, and being to competitive where a younger sibling is involved). What you did today may well stick with that young fisherman, at least somewhere in his mind, that he may well be able to recall some other day while he and his younger brother are fishing." "I have spoken to several guides since I've been here in Key Largo, you are the first one (guide) that I have talked to, that really never bragged about how good a fisherman he was. Instead you said go to my website and look at some of the photos. Looking at your website, photos and reading about you and your experience and experiences, tells me about the kind of person that I have met and the kind of person that I would like to take my son and I fishing. I think you are a very fine person, and appear to be a excellent guide, and friend." Actual Letter: Capt. Rick, it was truly mine and my wife's pleasure to meet you and your wife yesterday at Willies. It was nice to see how you handled your young friend, from a previous fishing trip. I feel that you may have instilled something in that young angler, that well may have been eating him up inside (the competitive nature, and being to competitive where a younger sibling is involved). It really is our nature to want to catch the biggest fish, or the most fish every time we go, but this is why it's called fishing. We don't always catch fish every time we go and must keep in mind and chalk it up as a learning experience. We need to try and figure out, did I do something wrong, would we have been better off fishing and focusing on another species, would a different pattern have possibly worked better. All of these I have asked myself several times while Tournament Fishing. I like you was a Sponsored Fisherman, and it puts a little added pressure on us, as our sponsors expect more of us, as we are representing them as well. What you did today may well stick with that young fisherman, at least somewhere in his mind, that he may well be able to recall some other day while he and his younger brother are fishing. It almost sounded as though his younger brother may already have it, as he rooted his brother on with every fish he caught. Rick, I have spoken to several guides since I've been here in Key Largo, you are the first one that I have talked to, that really never bragged about how good a fisherman he was. Instead you said go to my website and look at some of the photos. Looking at your website, photos and reading about you and your experience and experiences, tells me about the kind of person that I have met and the kind of person that I would like to take my son and I fishing. I think you are a very fine person, and appear to be a excellent guide, and friend. I would be honored to schedule a trip with you for my son and I. Right now I'm really not sure when in September he'll be coming, but, I will give you a call and see what we can do as soon as he lets me know. I have added your website to my favorites and will send it to my son so he can review it. He's a part time Redfish guide in Charleston S.C., and is Asst. Manager of one of the Charleston Angler Fly Shops. Again, it was a pleasure meeting you yesterday and thanks. I will be in touch. I want to say thank you again for our trip. Kristin was nervous about being out that long and that late, but you made it so enjoyable for her. You are great at what you do, and I hope to fish together many more times. I wish you well and hope to see you again soon. Pat and I had a great time fishing with you last month. Thanks for your hard work. This is an article I wrote about chowder and my African stew recipe too. Enjoy! but he is also a master pilot of his boat. If you want to see tarpon action and lots of it, I heartily recommend giving him a call." 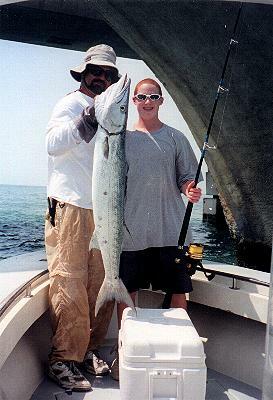 "If you enjoy sport fishing at all, one trip with Capt. Rick will make you a returning customer." "Adrenaline - It's why we are here, every aspect of your senses is heightened, all movements and feelings are more important. And you can get as much as you want with Capt. Killgore." "Rumors of his experience and knowledge prove true in spending just one day with him. In all honesty, involving tarpon, I have wasted two prior trips comparing the action you receive when you jump on that ice cooler (the fighting chair when we are racing through the bridge pilings) - you will know what I'm talking about. If you enjoy sport fishing at all, one trip with Capt. Rick will make you a returning customer." "Rick is a great host, he is helpful, great company, very experienced, and works harder than any other skipper or guide I have fished with. We caught tarpon every day (28 tarpon in 5 days). We caught fish to 160 pounds for me and 170 (lbs.) for my friend Bryan. Today, the fifth day, we caught 9 fish (tarpon) - 3 over 100 pounds - the smallest around 75 pounds. And there's still tomorrow!........". Actual Letter: "I traveled four and a half thousand miles from England in the hope of catching the fish of a lifetime." "I chose Capt. Rick Killgore by visiting his web site. Not the first trip I have made using the internet as an initial, but the first time I can say the web site UNDER STATED the fantastic experience on offer. There are no exaggerations." "The entire experience will live with me for as long as I do. I could list the fish here, but it's more than just the fishing. Rick is a great host, he is helpful, great company, very experienced, and works harder than any other skipper or guide I have fished with. His handling of the boat in pursuit of 100+ lbs. tarpon around the bridge supports (pilings) has to be seen to be believed." "Rick asked me to write a line or whatever to express my feelings about our six days with him. I hope from this that the reader gets a sense of just how fantastic our time here has been." "For the record, we caught tarpon every day. We caught fish to 160 pounds for me and 170 (lbs.) for my friend Bryan. Today, the fifth day, we caught 9 fish (tarpon) - 3 over 100 pounds - the smallest around 75 pounds. And there's still tomorrow!........" "Thanks Rick - you deserve all the success. I certainly hope to revisit." "On three different trips (one day each) our party has caught six, eight, and six tarpon (20 tarpon in three days) plus many other hookups and jumped fish! Absolutely the best fishing experience of my life!! I've been tarpon fishing previously with "Name" guides from Boca Grand Pass to Government Cut (Miami) on four different occasions and never caught a tarpon and only jumped one fish - we were skunked!" Actual Letter: "Fishing for tarpon with Capt. Rick Killgore is as close to a sure thing as I've experienced. I've been tarpon fishing previously with "Name" guides from Boca Grand Pass to Government Cut (Miami) on four different occasions and never caught a tarpon and only jumped one fish - we were skunked!" "My experience with Capt. Rick Killgore has been completely different - on three different trips (one day each) our party has caught six, eight, and six tarpon plus many other hookups and jumped fish! Absolutely the best fishing experience of my life!!" "Rick is without a doubt, the hardest working and most enthusiastic fishing guide that I have used. His skill in handling his boat in pursuit of an angry tarpon has to be seen to be believed." Actual Letter: "Further to the comments made by my friend, Mark Bailey, I am writing to reiterate everything he has said." 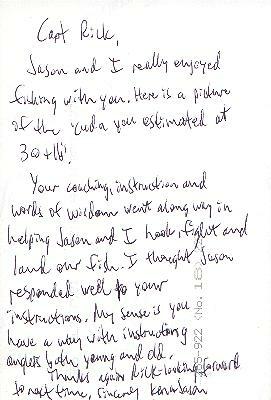 "Rick is without a doubt, the hardest working and most enthusiastic fishing guide that I have used." "His skill in handling his boat in pursuit of an angry tarpon has to be seen to be believed." "To summarize, when I return - and I will return! - I will have no hesitation in booking Rick Killgore as my guide." "Well my wife gets in the boat and lands 3 fish (tarpon) on 3 hits!!! We end up catching 7 tarpon for the day! If I could ever recommend a way to spend my recreational dollars, I can't think of a better way than to let Rick take me fishing. I'm afraid to say that the two times I've been on the water with Rick Killgore have spoiled me rotten!" Actual Letter: "For most of my life I have been an avid bass fisherman! I've caught a lot of solid fish in my day. However, I'm afraid to say that the two times I've been on the water with Rick Killgore have spoiled me rotten!" "In June of 2000 I was going to Ft. Lauderdale and decided I would live out a fantasy of mine and go tarpon fishing. Went on the internet and got lucky enough to find Rick's web site. When speaking to him he seemed overly confident compared to others I had spoken. Something told me this guy was on top of his game so I went with HIM!" "When I got there we had a ball. It was only for half a day but in the end I was glad. We went together to get bait, and took a good boat ride through the beautiful keys to the bridges. Upon instruction and baiting up it wasn't a minute before a huge tarpon blew up on my bait. Being a bass fisherman I lowered the rod tip and lost the hook set." "Rick confidently let me know that I did the wrong thing! Anyway, I ended up catching three of these beautiful fish. Two were over 70 lbs. and one around 40 lbs. This was on 10 strikes, 6 on, and 3 to the boat. What a (half) day. It's wonderfully exhausting!" "In June 2001, this time I get Rick for a full day. We go get bait. Rinse off in ten foot of water and check out the spiny lobster under a shelf (grass ledge) under the boat. Again, take the beautiful run to the bridges." " This time we caught a couple of tarpon in the 50 and 70 pound class and then go to the bridge to pick up my wife (we do this when someone does not want to fish all day). I already lost a least four of these things (tarpon)! Remember I am a bass fisherman and my instincts told me to do the wrong thing when the fish hits!" "Well my wife gets in the boat and lands 3 fish (tarpon) on 3 hits!!! We end up catching 7 tarpon for the day!" "If I could ever recommend a way to spend my recreational dollars, I can't think of a better way than to let Rick take me fishing." "Thanks for a fish of a life time (13 3/4 lbs. bonefish). Thanks (Rick) for never quitting even when we had the wind, clouds, tide, and a few poor fishermen to overcome. The story on your web site was great, I felt like I was there again." Actual Letter: "Thanks for a fish of a life time (13 3/4 lbs. bonefish). It was beautiful to see 'our' fish swim away unhurt. Thank you for the fishing lesson on holding the rod and line with my finger (Bob is an avid surf caster with conventional reels). That has troubled me for years, I now feel better about spinning reels. The story on your web site was great, I felt like I was there again. Thanks for never quitting even when we had the wind, clouds, tide, and a few poor fishermen to overcome (we probably had a couple of guys cut us off on the flats as we were fishing). Here's a photo, I look like I'm holding a baby, only because I didn't want the fish to jump out of my hands and get hurt." Rick is a truly unique fishing guide that believes in crew participation, which is so important. Rick "fills you with his year's of knowledge" and this is so different from all of the Keys guides who simply "take you fishing." Actual Letter: My friends and family have been fishing with Rick for many years. Rick has successfully taught us how to skillfully land Tarpon leading to our "Best Day Ever" - 11 tarpon landed for 15 hooked up for 15 striking. ALL AT NIGHT under the lights of the 23 SeaCraft. I never thought that I'd be yelling "It's only an 80 pounder dad, horse him in, stop wasting time, we only have an hour left to beat it!" Well we did and the next day we celebrated our victory with Rick at the famous Papa Joe's. What a blast! This is what memories are made of! Fishing with Cap'n Rick is always a thrill and Rick makes the angler feel that they are part of a ship's crew chasing huge game fish. Rick is a truly unique fishing guide and a captain that believes in crew participation, which is so important. Rick teaches his crew (clients) how to catch and rig bait, rig lines and tackle, present the bait to the fish, and ultimately land the fish of their dreams. If you want to sit back and let the captain catch your fish, Rick is not the guide for you. Rick "fills you with his year's of knowledge" and this is so different from all of the Keys guides who simply "take you fishing." Rick is not just a guide, but a good friend who I often talk with in the off-season when I get cabin fever in Ohio. I look forward to growing old fishing with Rick Killgore.